Start/finish: All of the races start and finish at UW-Manitowoc which is located at 705 Viebahn Street in Manitowoc, WI. 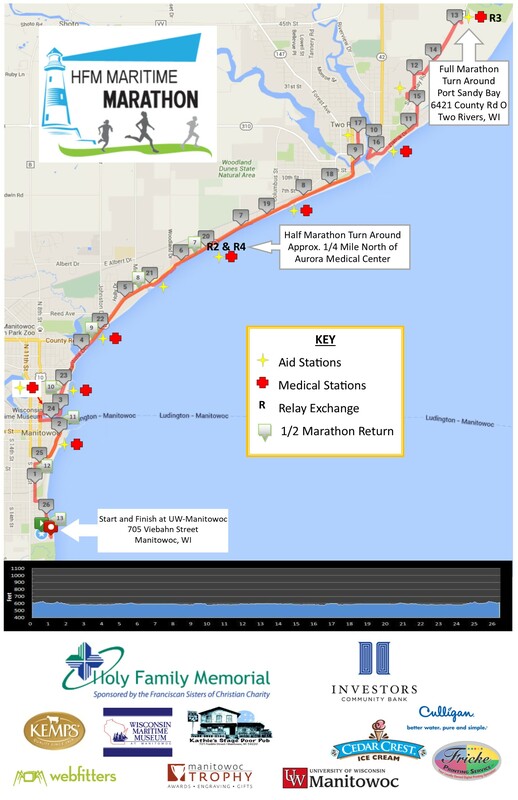 Essentially, the HFM Maritime Marathon will start at the University of Wisconsin-Manitowoc in Manitowoc and hug the lakeshore as much as possible on roads and paved trails all the way to Port Sandy Bay in Two Rivers and back. When does the HFM Maritime Marathon take place? The race takes place on Sunday, June 9, 2019. The full marathon and marathon relay will start at 7:00 AM (Central) and the half will start at 7:30 AM at UW-Manitowoc, which is located at 705 Viebahn Street in Manitowoc, WI. Where and when will the packet pickup take place? Runners may pick up their race packets (and last-minute runners may register for the events) at the Wisconsin Maritime Museum (located at 75 Maritime Drive, Manitowoc, WI 54220) on Friday, June 7 from 4:00- 7:00 PM and on Saturday, June 8 from 10:00 AM – 4:00 PM. No race day packet pickup is available. What is the typical temperature for June in Manitowoc? The average temperatures in Manitowoc for June range from a low of 58 to a high of 74 degrees Fahrenheit. There is plenty of free parking located in parking lots and on streets at the start/finish line at UW-Manitowoc. You can park your car only a few hundred yards from the start/finish. Where can I watch the runners during the race? Besides the start/finish area at UW-Manitowoc and the turn-around at Port Sandy Bay Pizza, the course passes several parks, as well as five scenic overlooks of Lake Michigan along the Mariners Trail between Manitowoc and Two Rivers. Take a look at the Spectator Information page for a spectator map. There are 16 aid stations along the course (located at under two mile intervals) that will offer both water and Gatorade. There will also be a station offering GU™ to runners. How many medical stations are there? There will be 12 medical stations located along the course along with a number of medical personal that will be on riding the course on bicycles in addition to the medical station located at the start/finish line area. There will be an individual full marathon, a half marathon, and a fourperson marathon relay offered for the 2016 race. Can I qualify for the Boston Marathon at the HFM Maritime Marathon? Yes! Our course has been certified by the USATF so any individual runner can qualify for the Boston Marathon. In a word: spectacular! The vast majority of the course features stunning views of Lake Michigan, with the course crossing both the Manitowoc and West Twin Rivers. The course is predominantly flat, although there are a few gentle hills. Bother races are out-and-back courses running from Manitowoc to Point Beach in Two Rivers. Will there be any pacing teams? Yes! We are happy to announce that On Pace will be joining us with pace groups for both the marathon and half marathon! Due to our race size there will be a limited number of pace groups. More information to come! Is there a limit on the size of the field for the race? The event organizers have capped the individual marathon at 500 runners. Where are the runner exchange zones for the four-person marathon relay? The exchange zone for the second and fourth runners is located across from HFM Woodland Clinic along the Mariners Trail, which is near the intersection of Woodland Drive and Memorial Drive in Manitowoc. The exchange zone for the third runner is in the parking lot of Port Sandy Bay Pizza, which is located at 6421 Sandy Bay Road, Two Rivers, WI 54241. We strongly discourage use of earbuds, headphones, or other such listening devices by runners. The course primarily follows nonmotorized-vehicle paths, but some portions take place on public roads. Although the roads are coned off for the runners and police and course marshals provide assistance at intersections, there may still be local traffic. We think it is better to be “safe than sorry” and to save the music for running on treadmills. Can I push my child in a stroller while I run? Sorry, strollers are not allowed on the marathon course. Can I have a family member/friend ride along on a bike while I run? Sorry, but that would constitute illegal pacing, which would result in a runner’s disqualification. The course will close after SIX hours (i.e. at 1:00 PM Central). What do I get for running the HFM Maritime Marathon besides great views? Every runner will receive a dri-fit shirt, a specially designed finisher’s medallion that highlights a unique feature of the Lakeshore area. At the finish line, enjoy complimentary food items (brat or burger), beverage (including beer! ), ice cream, and a massage. Stay around afterwards with friends and family to enjoy the post-race festivities. The men’s full marathon record is 2:38:48 run by T.J. Schmidt in 2016, and the women’s record of 3:06:44.7 was set by Laura Gillette also in 2014. The women’s half marathon record of 1:29:32.7 was set by Melissa Wentarmini in 2015 and the men’s record of 1:22:14.4 was set by Jace Galley also in 2015. Where do people come from to race the HFM Maritime Marathon? The Maritime Marathon typically has over 30 states represented, as well as a number of runners from foreign countries! How can I get in contact with somebody from the race? You can either email Dave our race director at dnick440@gmail.com or you can find us on Facebook.